Up until recently, Boy had never had a sloppy joe and I had only had one in my life (which wasn’t all that good). But then, the Cook’s Illustrated Light and Healthy 2011 cookbook came into our life. And that changed everything. Now we make sloppy joes probably about once a month for dinner. So the last time we decided to make that dinner, we had to convert it into a pie iron recipe. * Heinz makes a great No Salt Added ketchup. Start by heating 1 tsp of oil in a large nonstick skillet. Add the mushrooms and cover and cook over medium-low heat until soft (about 10 minutes). Uncover and increase the heat to medium high. Stir occasionally until the mushrooms are browned (about 10 minutes). When cooked, transfer to a food processor (or a bowl if you have an immersion blender) and pulse until the mushrooms are finely ground. Heat the other 1 tsp of oil in the skillet over medium heat. Add the mushrooms and onion and cover and cook until the onion is soft (about 10 minutes). Stir in the chili powder and cook for about 1 minute. Then add the tomato sauce, ketchup, water, Worcestershire sauce, sugar, and vinegar. Add the beef and simmer, stirring and breaking up the meat with a wooden spoon until the meat is cooked (about 5 minutes). Add your salt and pepper to taste. Toast your buns and great ready to get sloppy. Butter one side of each slice of bread. Place the buttered side down into the pie iron. 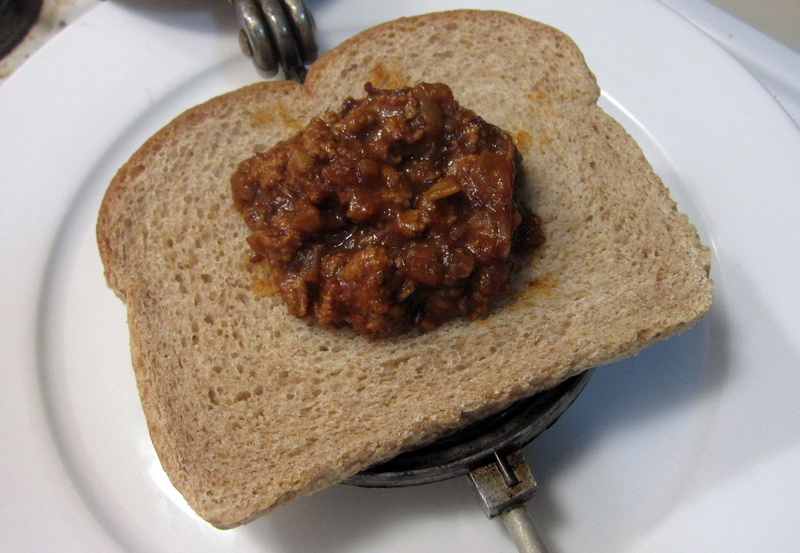 Dollop the sloppy joe mixture on top of the bread. If you can, get a little extra sauce in there to keep the meat moist. Stack the other slice of bread on top of that (buttered side up). Close the grill, trim the excess bread, and toast over medium heat for 2 minutes on each side, until the sandwich is golden. Serve it up next to as many sloppy joes as you can handle. 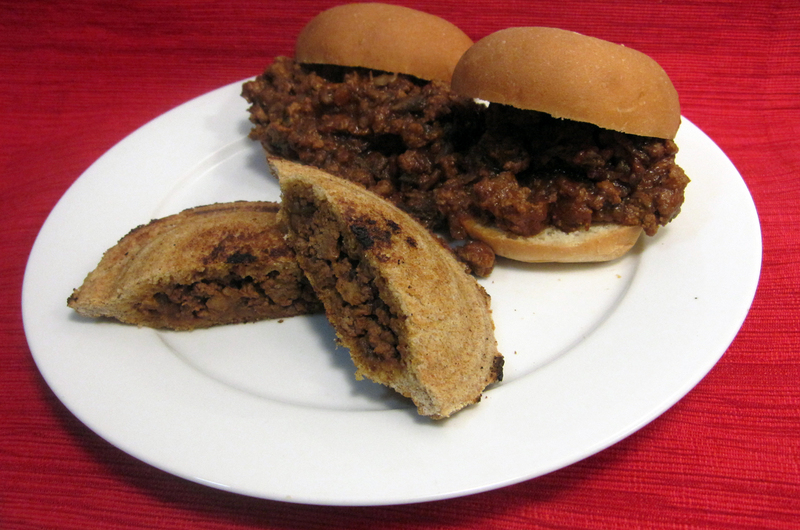 Before we dive into the Toas-Tite, we just wanted to quickly mention a few differences between our modified sloppy joe recipe and the Cook’s Illustrated original. We like to cut down on our sodium when we can so we opt for no salt added ketchup and tomato sauce. We up the ratio of mushroom to beef, just to cut down on the fat and cholesterol a wee bit more. For the Toas-Tite, you can see from our last picture that the pudgy pie version is definitely less sloppy than the original and the meat does cook a bit more. If you can get a bit extra sauce in there, that will help keep the sandwich moist.